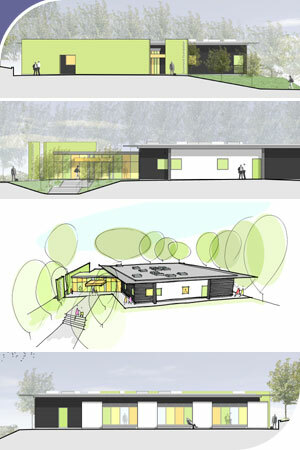 The proposal serves as an educational facility within the hospital site and is modestly scaled over one storey to ensure it sits well in its immediate landscape. Existing as a one storey facility also heightens the ease of navigation for the visiting user whilst giving the opportunity to utilise skylights thus creating a ‘healthy’ internal environment in which to learn, or assist in learning. The splayed entrance articulates directional emphasis towards the proposals entrance from the main hospital facility. This emphasis is strengthened by the green ‘fin’ wall which also gives the proposal an instantly recognisable identity. The project is currently in for planning and will have an approximate value of £850,000.